Published in London in the "Historia Mundi or Mercators Atlas" of 1635 by Michael Sparke & Samuel Cartwright. The original Hondius copperplates were sold to a London publisher, with the text translated into English. (The later issues published in Amsterdam by Jansson used new plates). Rare. 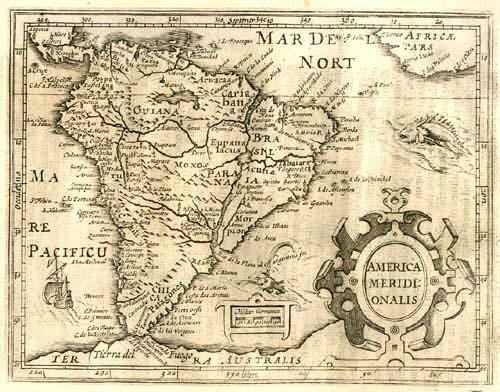 A decorative small map of South America with a page of text included. A strapwork title cartouche and seamonsters. The Strait of Magellan is show but Tierra Del Fuego is part of the large southern continent. Eastern Brazil is depicted as an island, made insular by a huge Rio de la Plata that extends from the Atlantic in the south to a large lake, Eupana Lacus. From this lake the Rio Grande flows further northward into the Amazon river and from there into the Atlantic.